A very long time ago, (it seems like a hundred years or so ago,) I got married, and this year we found ourselves celebrating our 25th wedding anniversary. As a treat for putting up with each other for so long we booked a holiday we had talked of for many years. 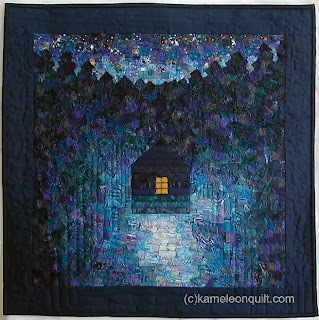 I knew that one day this image would be made into a quilt, and even bought the Kona solids from Cindy at Fluffy Sheep quilting (Cindy was amazing, I emailed her this photo and she sorted the colours for me). And the fabrics sat on my desk waiting for me to start. The push came when Fiona at Celtic Thistle opened up a Holiday Memories virtual quilt competition. So I cut and stitched and pressed and cut and stitched and pressed, and unstitched and stitched, and unstitched and stitched, and then pressed and embroidered and finally finished. 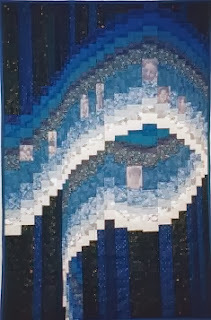 It finished about 26.5 x 18 inches - as with most of my patchworks it chose the size it wanted to be - nothing to do with me! I decided to use mostly black as the nights were really dark. The couple watching the lights were machine embroidered black on black, but I tilted the stitches at different angles so they would show as two people rather than as one. It is difficult to photograph as there is so much black. 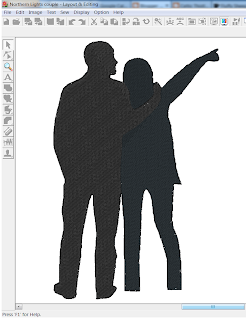 Below is a screen shot of the embroidery of the couple. It's not really based on Brian and I as obviously we are not in our own photos, but I think with artistic licence it could be us, we were there after all! The ship's railing were created by black satin stitch. What a wonderful way to keep a good memory! It is just gorgeous, Benta! The quilt is wonderful and I appreciated seeing the detail, especially the people, black on black is so difficult but you cracked it. A great way to remember your trip/anniversary. That's turned out really well Benta - worth all your work! interested to see the stitching direction change making all the difference on the couple - fantastic! Turned out beautifully, how great after your initial frustrations with it. Your quilt came out sooo lovely, - the green fabrics translated the norhtern lights perfectly. I am impressed that you got so good photos of the lights, - they are not easy to photograph, especially as the whole ship is moving. I am flattered that you mention my quilts as inspiration, and of course you may use the photos. I think it is great, - thank you very much for your nice comments. Great job missus, I see the blocking taught it a lesson in the end! Your quilt idea is so inspired. I'd love to see the Northern Lights. Think I shall go and browse your photos now. Terrific quilt! So glad you included close-ups and explanation, because is dark to see well. Very well done, and I'm so jealous that you've seen the Northern Lights! 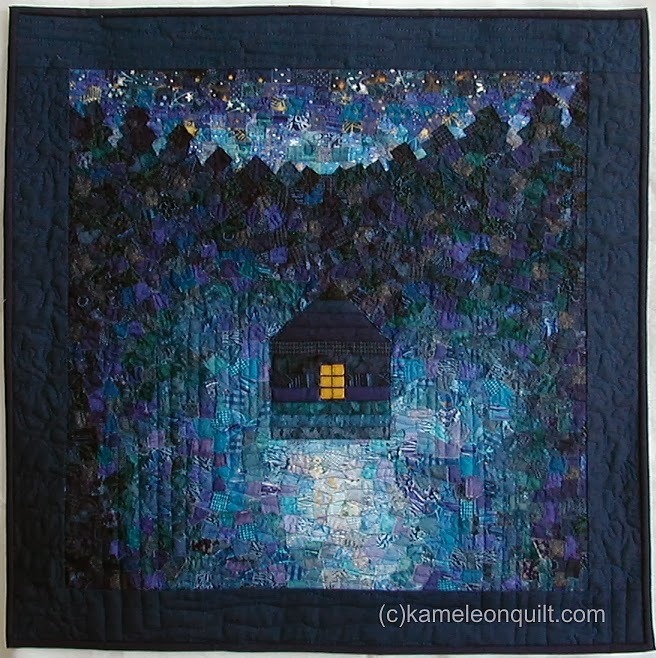 Oh wow, Benta, that is one beautiful quilt ! I still hope to see the Northern Lights one day by myself, but I think you captured it well! Absolutely lovely and a wonderful memory quilt of your anniversary trip. This is really amazing - so inventive! The black on black is really clever.